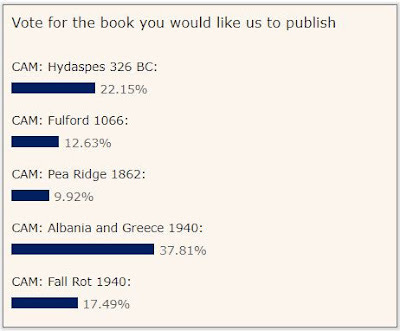 Have you seen this month's Campaign book vote? 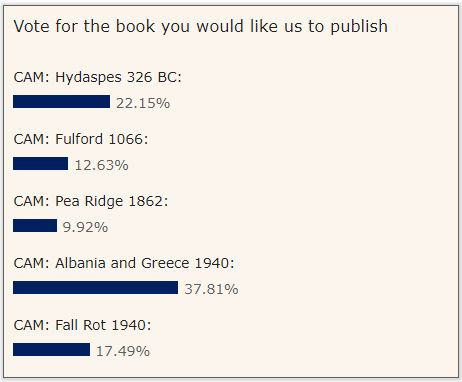 From Alexander the Great & the Battle of the Hydaspes to Mussolini’s attempt to create a new Roman Empire, there are five exciting new histories waiting for your vote. Alexander the Great’s campaign in India saw some of the bloodiest and most difficult fighting of his military career. This Campaign study wil tell the story of what happened when the Macedonian Army crossed into what is now modern Pakistan for the last of Alexander’s major victories. The battle of Hastings was the third major engagement fought by an English army in 1066, and the first was Fulford. Fought outside York between Harald Hardrada, the king of Norway and the English renegade Tostig Godwinson on one side, the northern earls Edwin and Morcar on the other, the English defeat forced Harold Godwinson to march his men northwards leaving the coast clear for William of Normandy to land unopposed. The battle of Pea Ridge was a major clash between Union and Confederate forces in Arkansas in 1862. The Confederate defeat left Arkansas, and Missouri, open to the Union. This is a major Civil War battle yet to be given the Campaign treatment. The Italian invasion of Albania, followed by Greece, was part of Mussolini’s doomed attempt to create a new Roman Empire throughout the Mediterranean. Although the Albanian element proved successful, the invasion of Greece was a disaster for the Italians and led directly to German involvement in the region. The history of the German invasion of France up to the evacuation of the BEF from Dunkirk has been well covered, however the fierce fighting beyond that, and the eventual fall of France itself, has been much less well told. Fall Rot will detail the final part of the story of the Fall of France in 1940 already covered in two Campaign volumes on Fall Gelb. Read the descriptions, select your favourite, and discover the results of last month's Aircraft of the Aces vs Combat Aircraft vote by clicking here.